I forgot about that and recently the same question was posted by a user in OTN. Perform the actions described in this post with caution. The method described here involves changing workspace default pages. Check your licensing agreements to see whether this can be customized. 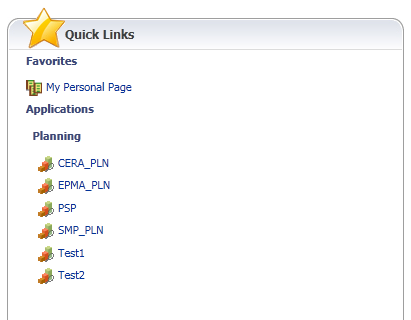 Login to Shared Services and perform an LCM. Select HomePage and export it. 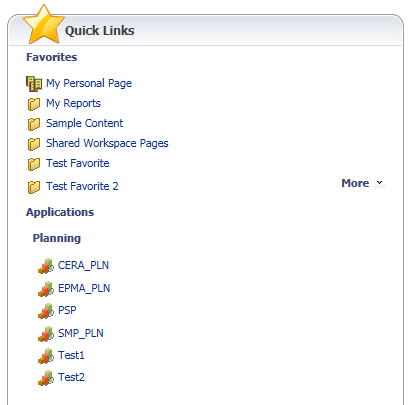 Expand Repository Objects and Shared Workspace Pages, select HomePage. Open HomePage_wsp (HomePage).HomePage_wsp in a text editor. You’ll find something similar to the code below. Once you update the showitems it affects both Favorites and Applications. I think my original questions was confused you. I actually like to know: How to expand / increase the number of items under "Favorites" area but "ABOVE" Planning. I would like to see at least 6-8 items under "My personal page" area. Congrates Celvin. I do not know if my question was posted already. I need to know which Xml file stores SSO enable check option in shared services ? Is it pooible to get same information from Repository table (backend) as well ? I am trying to add a hyperlink to my Hyperion workspace login page. Is there a way to achieve it ? Any idea on setting up the home page to a TaskList for a given Planning application for all users ? Out of the box functionality let's you choose the Application from the "Mange Preferences " option, but not navigating to a specific TaskList. Is there a way for us to change the label of the buttons in the workspace? The Home, New, Open, Explore button.